1. Maintaining public order in cooperation between citizens, police and the civil protection, to avoid any criminalization, politicization and manipulation of any protests. 2. Establishing a technical government, made up of professional, non-political party members, uncompromised people, who have not had a single mandate in any level of government, which would lead the Tuzla canton to the election of 2014. This Government shall have the duty to submit weekly plans and reports on the activities and achievement of given objectives. The government’s work is to be monitored by all interested citizens. - return the factories to workers and place them under the control of public authorities in order to safeguard the public interest, and start production in those factories where possible. 4. Balancing the salaries of government representatives to the salaries of employees in the public and private sectors. 5. Cancellation of additional payments to representatives of the government, as personal income, on the basis of participation in commissions, committees and other bodies, as well as other unreasonable and unjustified compensations that workers in the public and private sectors don’t have. 6. The abolition of wages for ministers and possibly other government officials, who are getting wage payments after the expiration or termination of their mandate. - Lower salaries and compensation for political functionaries at all levels of government! - End compensation with the end of the term! - Sell the new car pool and invest that money into development of factories in bankruptcy! - Reform and make transparent public expenditures and revenues! - Pass the law on property origins! - Process the suspects for abuse of power! - Invalidate all illegal privatization contracts and establish the responsibilities of authorities. - Form an independent anti-corruption commission. - Damage resulting from protests cover with that part of revenue intended for compensation of government representatives. Croatian Democratic Union (Serbcro. HDZ) is major Croatian political party in Bosnia. They are democratic Christian party of right centre. Party shares the name with party of the same name from Croatia, because in the 1990s they were originally one organisation. The Party of Democratic Action (Serbcro. SDA) is major Bosniak political party in Bosnia. They are the democratic Muslim part of the right centre. 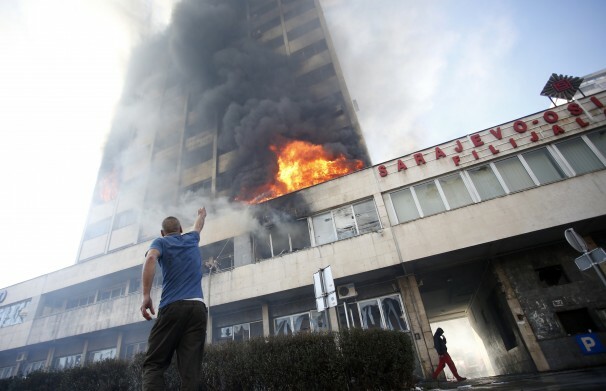 “EU to Consider Intervention in Bosnia if Tension Escalates,” Novinite. “Demonstranti se razišli, uspostavljen saobraćaj,” Al Jazeera. “Vijeće federacije RF: Stav Europske unije prema Sarajevu je politika dvostrukih standarda,” Ruski Vjesnik. Robert Bajruši, “VODEĆI HRVATSKI INTELEKTUALCI PREDLAŽU: ‘Evo kako riješiti probleme u BiH’,” Jutarnji List. Serbcro. Jedinstveni matični broj građanina (JMBG). Andreja Živković, “The People’s Uprising: A Break with Dayton Bosnia?” Lefteast. “Kaos i anarhija u BiH: GORILE ZGRADE VLADE: Gotovo 100 ozlijeđenih, uništeni brojni automobili, devastirane ulice…,” Jutarnji List. Marija Ristić, “Serbia, Croatia Meet Bosnian Leaders to ‘Calm’ Unrest,” Balkan Insight. “Statement by the Belgrade Police Union (Belgrade #1). “Radnici “Jumka” blokirali autoput kod Vranja. “Declaration by RS Veteran Union (RS #1). Jasmin Mujanović, “The Demands of People of Bosnia and Herzegovina. Thanks for posting this Iskra. 'Journalistic' style or no, it's the best piece I've seen on what happened a week ago. Are there any signs that this has had any resonance in Croatia? Thanks for writing this, as Slothjabber said this is the best piece I've seen come out, good mix of description and critical analysis. I passed through Bosnia, Serbia, & Croatia awhile back. I remember being stunned how much the infrastructure drops going into Bosnia from either of the other two, and learning that the current goals for "international aid" are to remove the mines around Sarajevo by 2020(!) iirc. In Serbia and even more in Croatia an ignorant traveler might not have even known that there was a war 20 years ago. Not so in Bosnia, Sarajevo and Mostar (the two cities I saw) still show the scars very visibly. This was made more visible because the Bosnians I talked with seemed to be very conscious that their problems were socially caused (whether the culprit was Belgrade, NATO, etc) and that things ought to be better than they were. Very good to see that may be turning into a class perspective - and very hopeful that this could spread to other parts of Southern Europe. That is an excellent article, thank you Iskra! I wondered if there is any revolutionary anarchist/left-communist groups in ex-Yugoslavian countries that could/can intervene or take part in these events? I think there was a small group of anarcho-syndicalists in Serbia... So what is the situation of the left/radical left there? @slothjabber: I don't think so. Croatia has a lot of problems, but I doubt that there will be any social movements for some time. There were few industrial struggles, but they were isolated. @OliverTwister: Half of Croatia is like that too. I live in town called Osijek (4th in size in Croatia) that has 72% unemployment rate and I have a minefield in 20 minutes walking from my apartment. If you go to South Serbia it's devastated too, even there was no war... just capitalism. This region is pretty depressing, but I hope that with time there will be more struggles like this that could shape consciousness or some kind of movement. @mikail firtinaci: Well, in general in ex-Yu there are 2 anarcho-syndicalist organisations (IWA section in Serbia), IFA section in Slovenia, 4-5 Trot groups, several "other" anarchist collectives and groups, anarcho-syndicalist/ultra-left group in Serbia (Birov) and my group in Croatia, which is let's call it left-communist (to make things easier for you guys in political sense), even we reject any tag except Marxist or Communist. Is there any level of coordination and solidarity between those groups? I think there was a meeting of Balkan anarchists last year but I could not follow if anything came out of it. I don't know. There is some I guess. I personally got really tired of leftists, so I'm "out of the game". All I can say is that all these groups are marginal and that more important and active are groups of lefitsts that came out of student movements (2009). They are connected with academia, intellectuals, journalists, unionists, worker representatives, NGO's etc. And left bemused after reading that. Do you know what inspired the cops or the demand? Cops probably cared more for their own skin then for politicans they probably also dislike. Demand is quite simple. It's a demand for stopping of violence, because nationalists might use it and it might provoke police repression. Even I think it was mostly because of media attacks. You know, when rioters set buildings on fire some towns looked like it's war again and media used it. So, I guess main reason is to stop media manipulation, but to continue struggle.